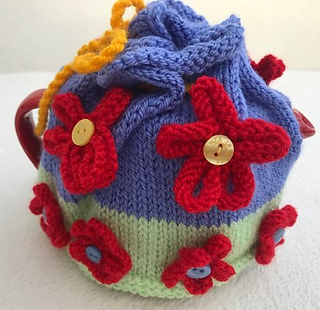 The pattern gives instructions for a tea cosy for two sizes of teapot. It is easily adjusted for any size. 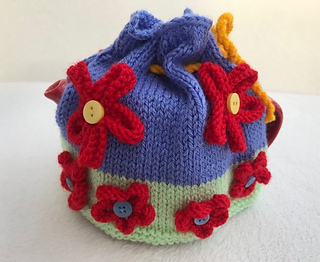 The cosy is knitted in two flat pieces and seamed along the sides, with gaps left for the handle and spout. Add as many or as few daisies as you wish! 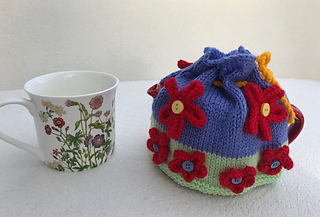 The photograph shows the small size of teapot and cosy with 8 small daisies and 4 large daisies. For different sizes instructions are given on how to adapt the pattern. The cosy is knit at a tighter gauge than usual for this weight of yarn, for good insulation. It is a generous size to fit easily.